19th Century Partner’s Desk — Bernacki & Associates, Inc. 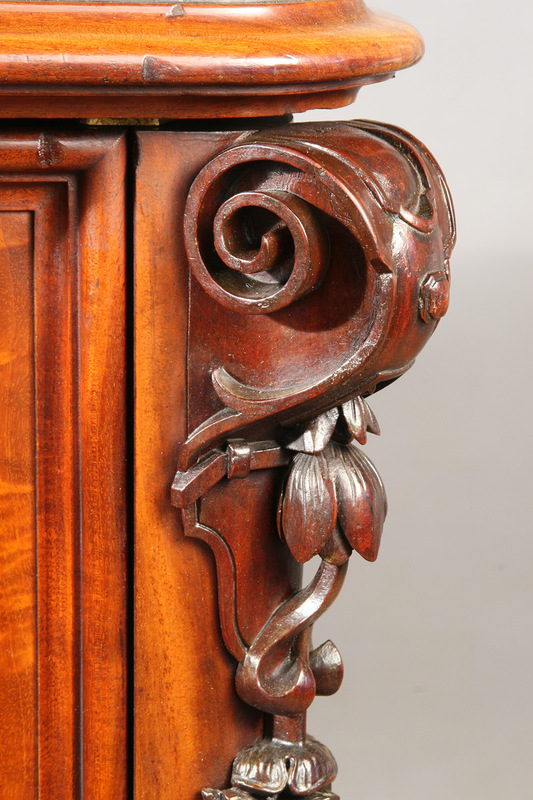 Solid mahogany, intricately carved floral garlands at each of eight corners, and a tooled leather top weren’t the only fascinating elements of this remarkable desk. A plaque inside the drawer attributed ownership to John Ruskin, prolific writer and perhaps the most prominent art critic of the late 1800’s. A piece of great historic – and aesthetic – value, the desk arrived at Bernacki & Associates desperately in need of restoration as skilled as its former owner. Among numerous issues, veneer was lifting or lost and drawers improperly aligned. Water damage affected both base and the desk’s lush leather top. As with many furniture pieces used on a regular basis, the delicate ornamental edges of the desk’s signature flower garland were now lost. Intent on returning the piece to visual splendor befitting of an art critic, Bernacki & Associates embarked upon a detailed treatment process. Drawers were re-aligned and door hinges, oil casters, and locks repaired. Thanks to Bernacki & Associates’ team of artisan woodworkers, missing elements of the flower garland were replaced with expertly fabricated pieces. When attached with reversible animal hide adhesive, these newly carved elements seamlessly integrated into the original decoration. With knowledge, skill, and artistry, the desk was restored to its former beauty.